Much of Salesforce1 at this point is just enabling it for your users and organization. However, there are a few things you can customize and tweak to make it easy and efficient to work in the field. You can define the users who can access Salesforce1, customize how data appears in it, create actions to add new records, and tweak it to make it match the look and feel of your company’s branding. Let’s look at how to find and accomplish some of these configurations. 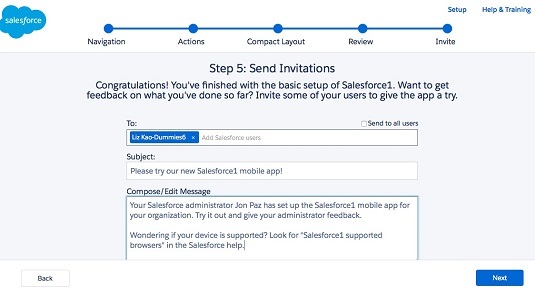 Salesforce makes this customization simple by giving administrators the Salesforce1 Wizard, which guides users with step-by-step customization options to make sure admins don’t overlook any features. Using the Salesforce1 Quick Start menu. Click Salesforce1 Quick Start from the menu’s left-hand sidebar. The Salesforce1 Setup page appears. Click the Launch Quick Start Wizard button. The Quick Start Wizard page appears. Click Let’s Get Started. In the first step, you can set up the left-hand navigation menu for your users in the Salesforce1 mobile app. You can reorder or remove items using a drag-and-drop interface. Click Save and Next to move onto arranging your Global Actions. Global Actions allow users to create new records quickly and easily, but these records aren’t tied to any other records in Salesforce. For example, an opportunity record won’t be automatically tied to an account record. Click Save and Next and then Create Compact Layout to move onto creating a compact layout. The compact layout used by Salesforce1 determines which key fields will be displayed at the top of the record detail display on the app. For example, you can choose to display a contact’s name, email, and phone number at the top of your contact records in Salesforce1 for quick viewing. When you’re finished, click Save and Next to preview your basic configuration thus far. Here you can look at different aspects of your configuration and see a simulation of the mobile app. After previewing what Salesforce1 will look like, click Next to invite some pilot users to take a test drive and give you feedback. This page allows you to email those users directly. Start typing their names in the To field and, if they exist in Salesforce, they’ll be suggested as you type. Click Send and then Finish when you’re done. Congratulations! The basic setup of Salesforce1 is complete and you’re taken back to the setup menu. Now you can configure some other aspects of the app, such as in-app or push notifications, the appearance and branding of the app, or user access to it. Inviting pilot users to try Salesforce1 and provide feedback.